Sealing Labels- Campbell International Specialist Tapes. - Clear unless stated otherwise. 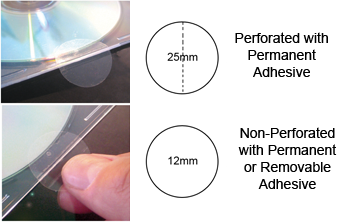 - Available with permenant or removable adhesive. - Used to seal boxes, letters, CD/DVD cases ect. - Large discounts available on buk orders with cometative branding/messaging options. - Material is non-yellowing, non-wrinkling, strong and durable. - Free samples available on request. 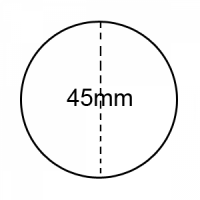 Dimensions: 25mm diameter. Quantity: Reel of 1000 labels. Technical Specification: Clear labels available with permenant or removable adhesive. Used to seal boxes, letters, CD/DVD cases. Large discounts available on buk orders with cometative branding/messaging options. Material is non-yellow..
Dimensions: 25mm diameter (Gold). Quantity: Reel of 2000 labels. Technical Specification: Available with permanent adhesive. Used to seal boxes, letters, CD/DVD cases. Large discounts available on bulk orders with competitive branding/messaging options. Material is non-yellowing, non-wri..
Dimensions: 25mm diameter. Quantity: Reel of 1000 labels. Technical Specification: Perforated to easily bend in half. Available with permenant adhesive. Used to seal boxes, letters, CD/DVD cases. Large discounts available on buk orders with cometative branding/messaging options. Material is n..
Dimensions: 25mm diameter (Silver). Quantity: Reel of 2000 labels. Technical Specification: Available with permanent adhesive. Used to seal boxes, letters, CD/DVD cases. Large discounts available on bulk orders with competitive branding/messaging options. Material is non-yellowing, non-w..
Dimensions: 30mm x 12mm. Quantity: Reel of 2000 labels. Technical Specification: Clear labels available with permenant or removable adhesive. Used to seal boxes, letters, CD/DVD cases. Large discounts available on buk orders with cometative branding/messaging options. Material is non-yellowin..
Dimensions: 32mm diameter. Quantity: Reel of 1000 labels. Technical Specification: Clear labels available with permenant or removable adhesive. Used to seal boxes, letters, CD/DVD cases. Large discounts available on buk orders with cometative branding/messaging options. Material is non-yellow..
Dimensions: .38mm diameter. Quantity: Reel of 1000 labels. Technical Specification: Clear labels available with permenant or removable adhesive. Used to seal boxes, letters, CD/DVD cases. Large discounts available on buk orders with cometative branding/messaging options. Material is non-yello..
Dimensions: 45mm diameter. Quantity: Reel of 1000 labels. Technical Specification: Clear labels available with permenant or removable adhesive. Used to seal boxes, letters, CD/DVD cases. Large discounts available on buk orders with cometative branding/messaging options. Material is non-yellow..
Dimensions: 45mm diameter. Quantity: Reel of 1000 labels. Technical Specification: Perforated to easily bend in half. Available with permenant adhesive. Used to seal boxes, letters, CD/DVD cases. Large discounts available on buk orders with cometative branding/messaging options. Material is n..
Dimensions: 50mm x 20mm. Quantity: Reel of 1000 labels. Technical Specification: Clear labels available with permenant or removable adhesive. Used to seal boxes, letters, CD/DVD cases. Large discounts available on buk orders with cometative branding/messaging options. Material is non-yellowin..
Dimensions: 50mm diameter. Quantity: Reel of 1000 labels. Technical Specification: Clear labels available with permenant or removable adhesive. Used to seal boxes, letters, CD/DVD cases. Large discounts available on buk orders with cometative branding/messaging options. Material is non-yellow..
Dimensions: 60mm diameter. Quantity: Reel of 1000 labels. Technical Specification: Clear labels available with permenant or removable adhesive. Used to seal boxes, letters, CD/DVD cases. Large discounts available on buk orders with cometative branding/messaging options. Material is non-yellow..
Dimensions: 74mm x 30mm. Quantity: Reel of 1000 labels. Technical Specification: Clear labels available with permenant or removable adhesive. Used to seal boxes, letters, CD/DVD cases. Large discounts available on buk orders with cometative branding/messaging options. Material is non-yellowin..
High quality security/tamper evident LabelsDesigned to stop theft and tampering to confidential or valuable goods acting as both a visual deterant and practical warning of tampering.Used in hundreds of industries including:Stock ControlAirline securityEquestrian (racing-horse sperm protection)Police..